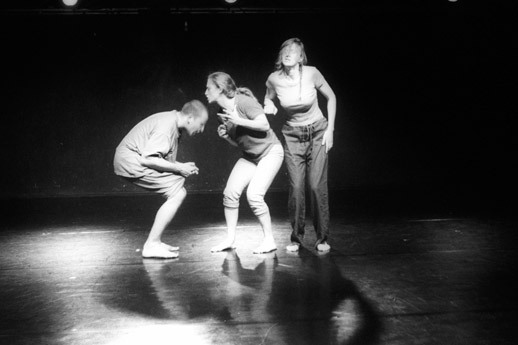 The working-out of a showMain ideas he core of the work relies on the relationships between Dance, Texts and Music. The main tool is to be concentrated on what is going on between the body and the meaning of what is said, words and sounds. The register goes from a usual relationship, socially recognized to (apparently) more absurd situations : from meditation to action. Workshops SessionsCreating experimental situations for the actor to keep acting more lively. Analyzing the movement in terms of simple physical laws and one’s relation to the world. Training to be concentrated on the perception of your body in all sorts of situations : from meditation to action. Adding the text, pummelling it, changing and turning its meaning upside down, playing with words, syllables, sounds, with a constant priority given to physical matter. Discord, concord between meaning and physical expression. For example “the submarine”: this can be tragically disillusioned, typically happy, evenly formal … depending on the occurrence or not of the TRIGGER. The Trigger ConceptOnce the structure has been built, priority is given to the TRIGGER. THE TRIGGER is the feeling of the “right time” when, like in Alice’s in wonderland, we change worlds. We reach an area where the only thing you have to do is to follow and no longer “to find your way”. The story builds itself up and asks us to be wise enough to follow it. Then, more or less easy but rather joyful fittings follow between the fountain of ideas and the other dancers : their triggers, their personalities, and their tracksuits … our usual deliriums and … the next dance session. If they come every night (…) spectators will never see the same show … it all depends on the actors’fitness, the quality of spectators, the hairdo of the usherette. Every play is entitled TRIGGER followed by the year and the month the performance was held on, for example in June 2006, you have : “TRIGGER 06. 6”.